From avoiding scope creep to identifying digital agency red flags, we’ve written a lot about vetting, hiring, and working with a digital agency to build your website. The world of an Atlanta web design company can often be filled with complicated jargon, stressful meetings, and business-defining delays. But sometimes you just need to hear about the experiences of people who have been where you are now — that is, in the midst of an important business decision. That’s why I’d like to introduce Andrew Mintz, VP of Marketing & Business Development at RealCommissions — the leading national commission advance service provider for the real estate industry. 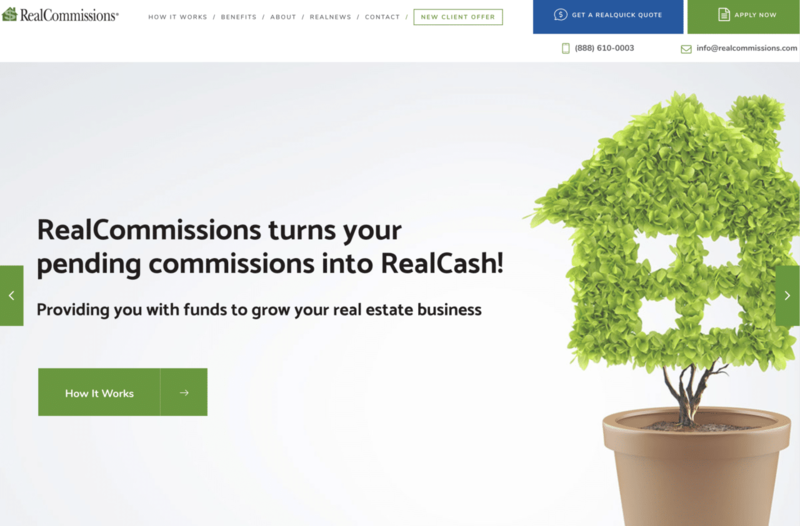 Our team had the pleasure of working directly with Andrew during a redesign of RealCommissions.com, and he was kind enough to take the time to chat with us about his company’s experience with Southern Web and our website project process. When did you know you were ready for a redesign? Around early 2017, we knew it was time to redesign our website since it had not been updated in a while. It had been recently optimized for mobile devices, but we had not changed the functionality, content, or “look and feel” of the site at all. Essentially, we were looking to freshen it up and make a few technical improvements. After meeting and talking with several digital marketing firms, we were very impressed with Drew Barton and the Southern Web team. We actually worked with Drew years ago, and we felt that the express web development proposal from Southern Web was more than fair regarding the scope of work and overall cost of the project. What problems were you hoping to fix with a new website? Beyond updating the aesthetics of the site, there were several goals we wanted to accomplish with the redesign. Some of the most critical improvements we needed involved streamlining the application process for clients applying for commission advances, as well as implementing a better way to generate prospect leads for potential new clients. 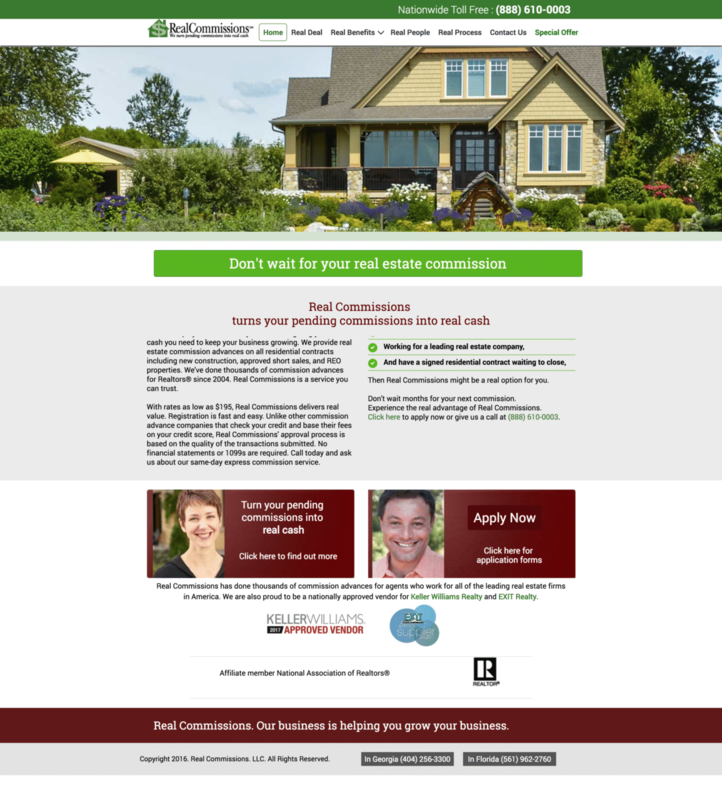 From a content perspective, we also wanted to present more information about the RealCommissions commission advance service so that our clients and prospects would have access to all the information they needed before requesting a quote or filling out an application. What was the project process like for your team? Following our initial project kickoff meeting, our project manager Kellye immediately jumped into action and we began making major progress through the multi-phase project process. One of the most critical phases in the project was content. Southern Web uses a web-based content workflow system called GatherContent, which was very easy to work with. It allowed us to collaborate on the sitemap and content in real-time. What was it like to work with a project manager? Our project manager, Kellye, was awesome to work with! She was very responsive, a pleasure to work with, and guided us from start to finish through the web development process. She also leveraged her past experiences with other website projects to give us design and content recommendations along the way. Your newly redesigned site launched in July 2018. Since then, what have you been able to achieve with your new site? We have seen record growth since the launch of our new website. In terms of lead generation and acquiring new clients, we have seen tremendous year-over-year growth. We have also shifted our method of communication and lead generation from phone calls to email leads. As a result, we are able to provide even faster turnaround times and improve our communication during the application process. What advice would you give other companies looking to redesign their site? I would advise other companies to do their homework in terms of what they are looking to accomplish, and be sure to consider their goals and objectives for redesigning their site. I would also definitely recommend having a conversation with Southern Web about their digital marketing and website development expertise. Their team does a great job in helping to develop a strategy, and also recommends technical tactics to drive traffic, leads, and revenue. Want to learn more about working with Southern Web – The leading Atlanta web design company? Learn more about our services and our work, and don’t hesitate to contact us.